Fresh remains of looting activities from the night before. The looters' footprints are still clearly visible and the two spent quids of coca that have been placed on the rock are still moist. 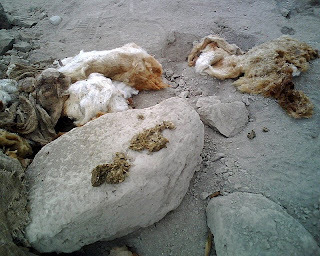 Shreaded cotton textiles and alpaca fibers have been discarded by the looters. Huaura Valley, Peru. Photo by Nathan Craig as part of the Blackberry 8100 Perl study.